Maybe you’ve heard the old adage, “The only thing that is constant is change.” This saying, sometimes attributed to the greek philosopher Heraclitus, rings true again in the life and future of Sunnyside. Many of you received an email from Pastor Scott yesterday, detailing his plans for retirement in 2015. Click here for letter. With Pastor Shirley moving to the conference office within the month and Pastor Scott slowing down a bit to care of his own health, the pastoral team that you’ve come to know is changing. As a result of Pastor Scott’s announcement, we will convene a business meeting on April 15 at 7 PM to begin the process of finding a new Senior Pastor for Sunnyside Church. Every member is encouraged to attend so that your voice can be heard in the process. As unsettling as change can be, I have confidence that the best days of Sunnyside are yet to come. A church, at its best, is not dependent on the individual efforts of a pastor or a pastoral team. Instead, it is dependent on the faithful devotion to God, a passion borne of God to take the gospel into the world, and a commitment inspired by God to make sure the church is a community in which everyone can feel at home. “But you are a chosen race, a royal priesthood, a holy nation, a people for God’s own possession, so that you may proclaim the excellencies of Him who has called you out of darkness into His marvelous light; for you once were not a people, but now you are the people of God; you had not received mercy, but now you have received mercy. God continues to call the people of Sunnyside forward to “proclaim the excellencies of God.” He has blessed us over the last five years with the leadership of Pastor Scott (who isn’t through yet.) By His grace, God will continue to lead His community forward with vision for the future. This Sabbath, like many at Sunnyside, will be a busy one. Pastor Scott will be preaching and leading us in our communion service. Immediately following the worship service, we will screen the second video in our Millennial Matrix Series. The title: “Reaching the Millennials.” Please bring your lunch and eat while we watch and discuss the video. Two weeks ago, we had 25 people stay to watch the video after potluck. That was a good showing, but there are many more of us who would benefit from seeing it. Please consider bringing your lunch and joining in the conversation. Tomorrow evening, we will be blessed to host Christian Edition in concert at 7 PM. Plan to come and enjoy the music as we close the Sabbath together. May God grant each of you a rich Sabbath blessing! See you tomorrow! Our communion worship services are at 8:45 and 11:15 am. Pastor Scott LeMert will present our Bible message entitled Betrayed, Broken, Bruised, Risen. This evening at 7:00 pm, Christian Edition, directed by Calvin Knipschild, will be in concert here at Sunnyside. Bring a friend! March 28, 8:45 am Worship Service with Pastor Scott LeMert presenting Daniel’s Messiah. 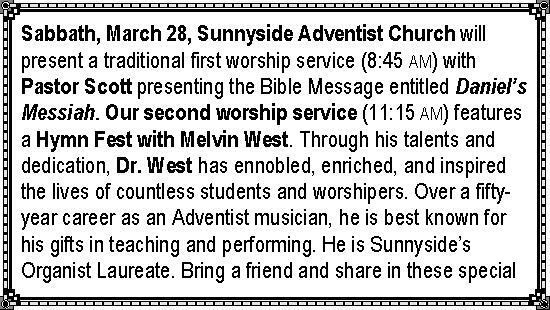 11:15 am: Worship Service with be a Hymn Fest with Dr. Melvin West. March 25, 6:30 pm: “The Gathering” presents good food and Christian fellowship featuring special guest: 300 Watts String Trio. To register call 503-503-6018. April 12, 5:00 pm: NW Veg Gresham Area Vegan Community Potluck. Please join NW Veg in welcoming Paige Common, owner at Eatin’ Alive, as we hop into Spring with some delicious new ideas on how to use fresh greens to prepare wraps and sauces as well as a light decadent sweet treat. Please bring a Vegan (plant-based) dish with no animal products (including honey) and a card listing its ingredients. NW Veg strives for a zero waste event, so please bring your own plates and utensils. For more details go to: www.nwveg.org.